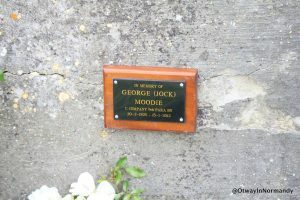 George ‘Jock’ Moodie was born in Edinburgh in Feb 1925. A keen footballer, he was expected to play for Hearts until the war got in the way. When his call up papers came he wanted to join the R.A.F as a gunner. They promptly put him in the army. 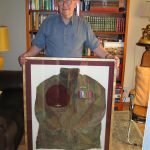 He joined the Royal Scots for 8 months when he saw the poster asking for volunteers for the Airborne he promptly applied (the extra 2 bob a week did it!). 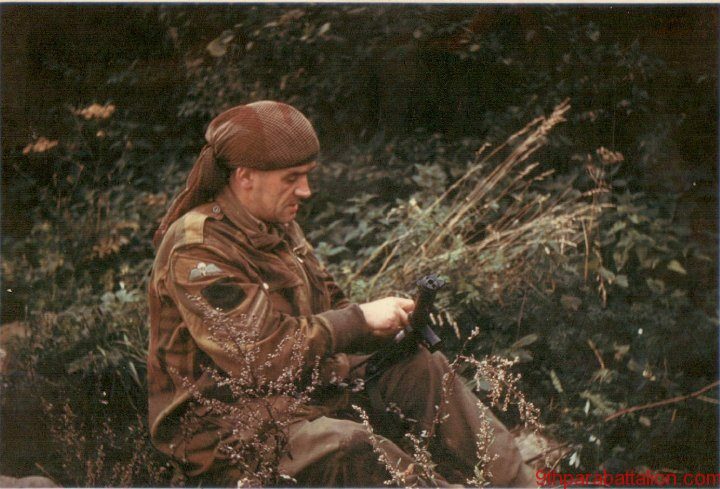 He soon found himself at Hardwick Hall, at that time the paras training depot. After passing through the training he went to Ringway to get his wings and after successfully completing his 8 jumps was awarded the red beret and wings. Further training followed at the battle camp where his training intake was split in half between the 1st and 6th Airborne divisions. 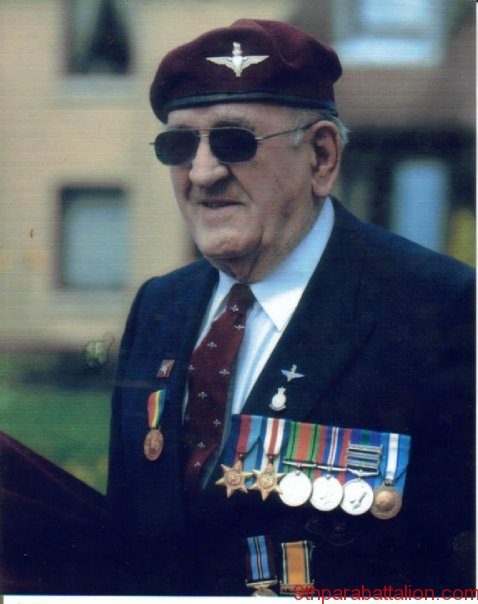 He was placed in the 9th para battalion, formerly the 10th Essex, in 12 Platoon of C company. 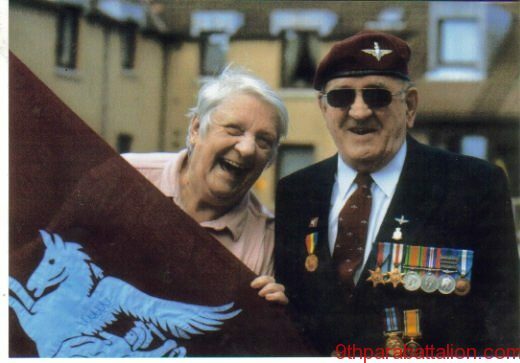 His Platoon commander was Lt Alan ‘twinkle toes’ Jefferson. By this time it was early 1944 and the build up to D-Day was in full swing. 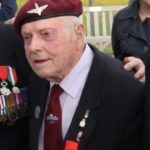 In the early hours of D-Day he was lucky enough to drop onto dry land, meeting a couple of men from C-Company they made their way to the RV where they found Lt Col. Otway on his own. 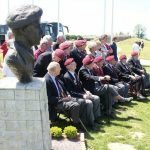 After a while and with only 150 men they moved up to the firm base to carry out the attack on Merville Battery with a much improvised plan. Dad went in with Alan Jeffersons assault group, going through the wire; he stopped to help a mate who’d got himself entangled and dropped his rifle before carrying on into the battery heading for Casemate 1. He saw Alan Jefferson get hit and go down on the way. He reached the casemate after Sid Capon and Frank Delsinior who had already entered. After some hand to hand fighting in and around the casemate, the artillery piece inside was put out of action. 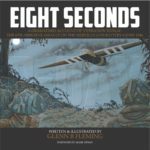 After helping with the wounded and signalling the navy, the survivors – numbering approx 65 – made their way to the 2nd objective. 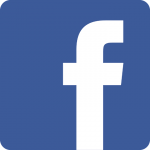 Dad remembers seeing col Otway with his head in his hands at the Calvary Cross. 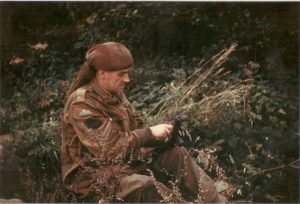 George was with the Battalion all the way through the Normandy campaign, having to be a a impromptu mortar-man at St Come. He Returned to England in early September for much needed rest, recuperation and replacements. 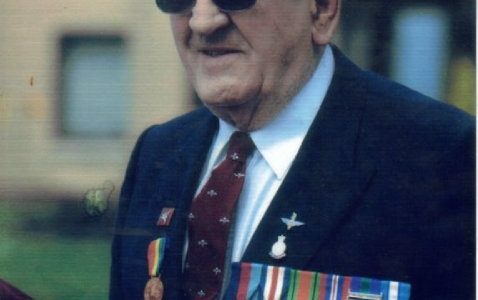 George continued to serve with the 9th Battalion through the Ardennes campaign and the Rhine crossing which he said was the worst thing to be in and witness, losing a lot of friends. 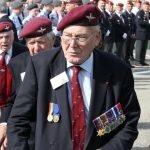 After the war he went to Palestine for 3 years, ending up in the 3rd Battalion when the 6th Airborne Division was disbanded. He met and married Hillary Slone in 1949 – she was a parachute packer. He left the army for a year before wanting back in. When he rejoined the recruitment office thought he was a newbie and he was given a 2nd army number. 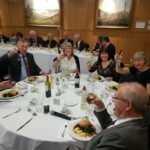 He returned to the Royal Scotts again as direct entry to the Paras didn’t happen till 1953. Upon transfer to the paras he had to go through the entire P course again along with other returning veterans. George did 2 tours at P.C.A.U. (Parachute Course Administration Unit) and in 1953 took part in the making of The Red Beret starring Alan Ladd. He did most of the jump scenes and can be seen in the aircraft doing his chin strap up just before Stanley Baker candles in. He served in Egypt, Greece, Cyprus, Jordan but missed the Suez drop – much to his annoyance. 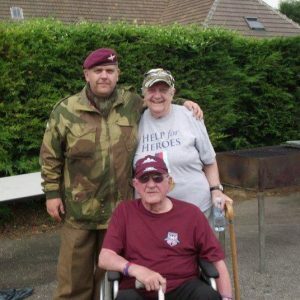 He finally left the paras just after his son Doug was born in 1966. He then served as a Sergeant in the M.O.D. police until retiring in 1985. He returned to his native Scotland in 1992 settling down in Glenrothes, Fife. George had five sons, 4 of which followed him into the paras, the eldest following our maternal grandfather into The Duke of Wellingtons regiment. (Hat). George also had 3 daughters, 2 of which followed Hillary into the RAF (1 died at 3 months old). George’s last visit to Normandy was 2011 where he was interviewed for the BBC documentary Regimental Stories. 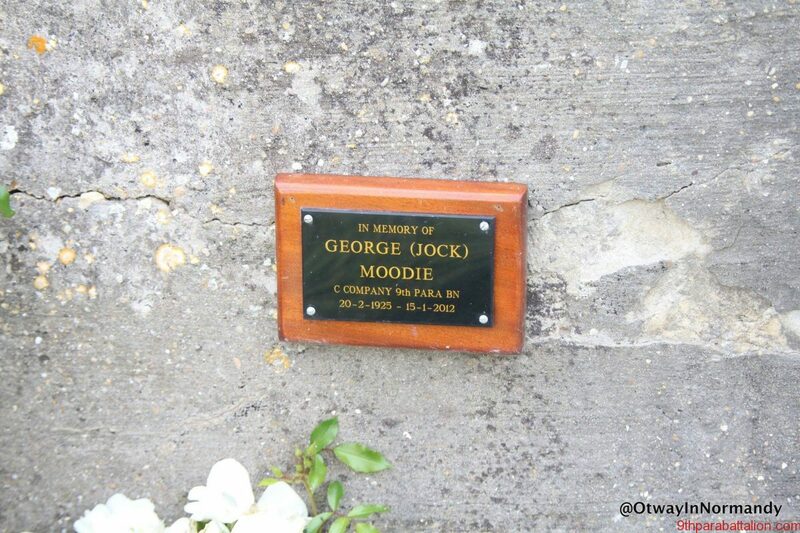 George passed away in January 2012 and his grand-daughter Izzy Roberts jumped his ashes into Normandy that year and scattered them outside Casemate 1 of the Merville Battery. Hillary passed away in 2017, and Doug is looking to scatter her ashes at the same spot as George.